The sponsorship opportunities you have through My Olive Tree aren’t just limited to olive trees; we also are working on a project in the Negev that allows people to sponsor grapevines in the region. One of our main goals at My Olive Tree is to reclaim the desert and to bring flourishing agriculture back to the people of Israel who have suffered so mightily over the centuries. We believe that our mission can help to fulfill scripture passages about rebirth in the region, including the one above. But to accomplish this mission, we need the help of our generous sponsors like you. It takes about four months for us to prepare the grapevine cuttings so that they are ready to be planted. 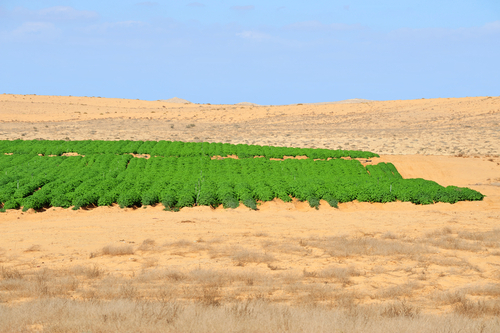 They need to be strong enough to withstand the desert climate and thrive in the occasionally tough, harsh soil found in the Negev. All of our cuttings come from vines already growing in the Negev, which we then plant in pots, wait for them to grow larger, and repeat the process until they are ready to be placed back in the earth. Your sponsorship allows us to continue planting more vines to help bring life back to the desert and agriculture and hope back to the people of Israel. For more information about our Grapevines in the Negev project, we encourage you to contact us today at My Olive Tree. We’re happy to answer any questions that you have!